This is a great light with some really nifty features, e.g. the little screen that tells you how much battery is left, and the ability to switch quickly between a normal and very bright light. However, the clamp to fit the light to the bike is rather bulky and limited in the range of bars it will attach to. I have a bike with 'hybrid' cable-actuated hydraulic brakes, which work well but don't leave much room on the handlebar, and I was unable to fit the clamp for the light in anywhere. The bike manufacturer provides a bracket that adds a sort of mini-bar that sticks out from the front for attaching lights etc., but this bar proved too narrow for the clamp to fit. I ended up sending the light back, which is a shame because the light itself seems like a great product. This light leaves me with a bit of a quandary. It does cost a lot of money but there are much more expensive lights out there. For the money the build quality appears very good. The fastening options are numerous and effective. I can see why other reviewers had problems getting a firm fixing. I remedied this by bulking out the shims with black insulating tape. Simple, invisible and effective for me anyway. When the light is working it is brilliant. It throws out a phenomenally bright light with a fantastic and controlled beam pattern. The dip beam is brilliant and I love the remote switch. However I used the precursor when it is working. In the six weeks I have had this light it has cut out three times on the way home. It has taken 5-10 minutes to restart. I assume it has cut out due to overheating. However as the temperature was below 5 degrees and I was running a low power beam I dread to think how it would cope on high beam in warm weather. The other day I was unable to charge the light. Plugged it in no charging symbol. Turned out that the power point in light not firmly attached and pushed into into light housing. Therefore not attaching properly and no power. I had to remove the rubber protection round the power point to remedy this. So now I have no weather proofing round the power point and I have probably invalidated my warranty. I have to get to work. For this price I would expect a light that lasts a good few seasons. It does not seems to be looking that way. This is close to the best light I have ever owned. It appears however that it has not been thoroughly road tested to iron out little niggles. So five stars when working however three stars given as lights are meant to work 100% of the time. Astonishing light. Well built as well. I really recommend this light! Bright, long lasting and the charge feature was incredibly handy. Heavy but worth it for the performance. Great light, excellent off road. Used it last week, brilliant. Pros. Great product. Impressive build quality. Perfect to ride in the forest as I intended to use it, it has plenty of power when using the both leds. The 5v charging outlet works like a charm. The battery is decent enough, do expect at least 5 hours using medium power settings. Cons. It is quite heavy for its size. The "car light" like function could be better I guess, by sending less light upwards, it is still being annoying for the people coming towards you. Happy with performance of light but I also chose it specifically because fo the ability to charge other devices (mainly a Garmin on long rides) All works well but difficult to tighten up enough to stop it slipping on the bars even with the silicon tape provided for 31.8mm handlebars. It also has some side to side movement which is not ideal but I'm sure there is a way to use a shim to stop this. Fantastic light! 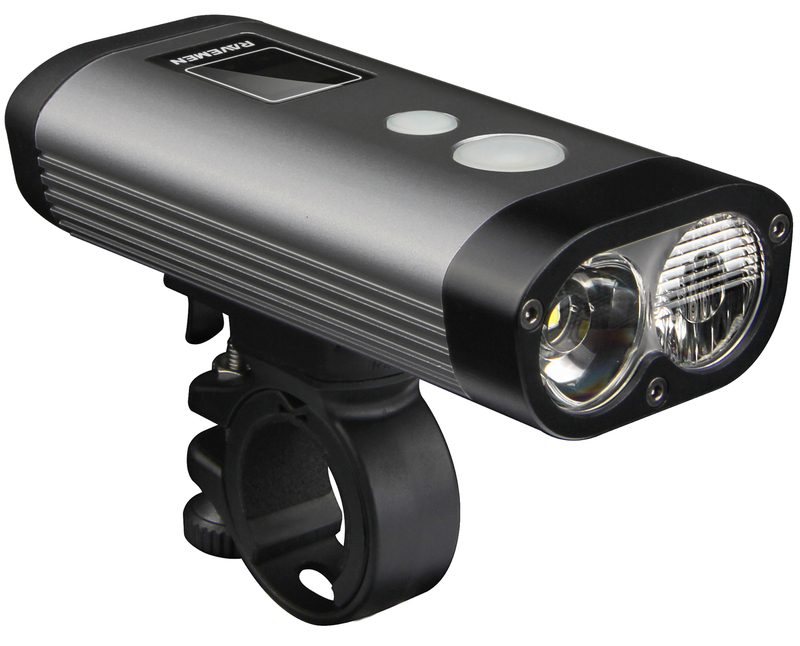 It truly delivers on the promise of an anti-glare light for the road and an all around light for off-road cycling. It's built tough and feels secure. The handlebar fitting is very secure and doesn't jiggle like some reviews suggest. Maybe they've listened improved it or I got lucky but either way it's a perfect fit. Good strong light with a nice wide beam. Smaller but heavier than expected. I like the fact that you do NOT blind oncoming traffic, and the amount of light coming out, even at low beam, gives me the confidence to go down unlit descents at 25-30 mph. I have not yet used the remote. The charge indicator on the light seem to be accurate. Charging via the laptop takes long though - however this is also indicated by the manufacturer. The bracket holds firm on the handlebar when you tighten it. The only slippage I have experienced was in the beginning when trying to find the right angle. Most expensive light I have ever bought so was expecting a lot from it. Living in the country, last winter was spent second guessing where corners and pot holes were but with the PR1200 there's no need now. It is a brilliant light, I love the dip switch so it doesn't dazzle oncoming cars. The digital display with the countdown time remaining seems to be working spot on (so far), now I don't panic that it's going to run out before I reach home!! The mounting fitted well and hasn't moved position despite the light unit being quite a heavy weight. I've tried using the remote switch but not convinced it's needed. Overall it's a brilliant light and I'm very happy with it, can't fault it so 5 stars from me. Good beam, good battery life and recharging USB capability. Mount is up to the job. Works well, long battery life with a remaining time indicator that is realistic. Has a beam that can be shaped to suit needs of different types of riding & avoiding dazzle to oncoming traffic.